We've all seen the movie.....now have a chance to play in it! 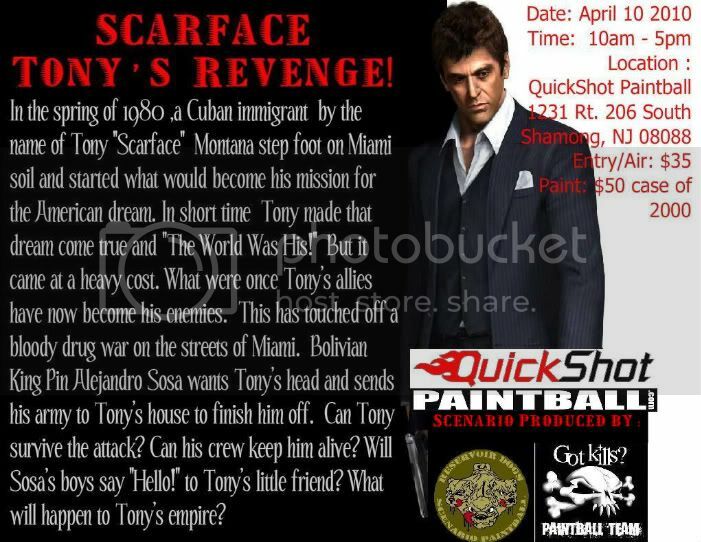 This game will put Tony and the "Cuban Cartel" against former associate Alejandro Sosa and the "Bolivian Boys". Miami is the scene of this intense battle for the streets and to be the Top King Pin! This game will feature a format and missions like no other scenario has offered! More details, command roles and registration link to follow! Lock it on your calendars players....you wont want to miss this one! Game will be capped at 200 players! This game is going to be awesome and for anyone whos tired of the same old scenarios - please come check this game out!! you will not be disappointed !! There will be many characters,missions,duffle bags full of money and other stuff we cant mention here lol as well as prizes and raffles!! Registration is up and running for the game....get signed up early so you wont get turned away!